N3 residents are moved in! Looking for a lunch spot with enough options for you, your co-workers, and allllllll your vegetarian, vegan, dairy-free and gluten-free needs? @sidewalkcitizen has got you covered! Every week they have a meat feature and a veggie feature, available as a salad, pita, or in a ciabatta bun. And you’ll definitely want to save room for something sweet – trust us!! We can hardly believe how fast the M2 project is moving! Construction on this zig-zagging, mixed-use building by @xycdesign will be finished by the end of this year. When complete, restaurants and retail will spill out onto RiverWalk, while office space and large terraces occupy the upper levels. Curious to learn more about M2’s design? Check out XYC’s lecture event on April 17, where you can hear from the building’s architect, @narchitects_pllc. 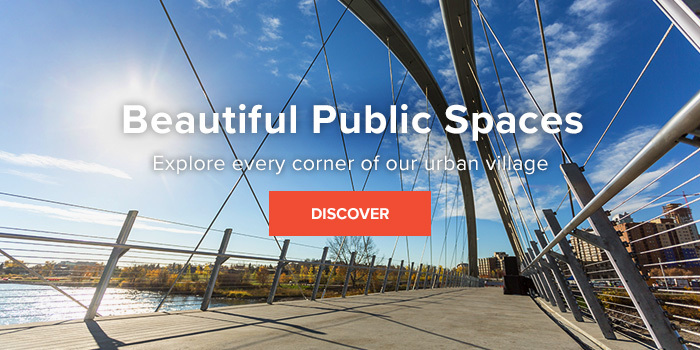 Are you a resident or business owner in #eastvillageyyc? Want to get involved in the community? Join the East Village Neighbourhood Association (@yycevna) for their 2019 AGM this Saturday! 10:30AM at the St. Louis Hotel (430 8 Ave SE). Spring has sprung, which means food trucks are coming out of hibernation! Join @yycfoodtrucks at C-Square for their Spring Frenzy on April 27 & 28, where there will be live music, entertainment, giveaways and #allthefood 🍔 🍕🍗🌮 Open 11am-7pm both days, admission is $5 (free for seniors and kids under 14). We are BEYOND excited to announce that #YYC artist @katiegreenart will create the 4th temporary installation in our RiverWalk public art program! This artwork will be particularly special because East Villagers will have a chance to get involved. Participants will explore the theme of empowerment through anonymity in a series of mask-making workshops, and then be photographed wearing their masks in spaces around EV. Want to learn more about the process? Come to Katie’s info session on April 13th at the St. Louis Hotel, noon to 2pm. Head over to #StPatricksIsland tonight to celebrate #EarthHourYYC with Open Streets! Unplug from your devices from 7:00-9:30pm to join in on all the fun, like a DJ dance party, fire pits and games. For the older crowd, there will be brewery tours leaving by foot and by bike at 8:00pm. G I V E A W A Y 🍻 Want to win a summer craft beer tasting for you plus 7 of your brew-loving buddies? Heck yes? That’s what we thought. To enter, tag a pal and follow @the.brewers.apprentice, East Village’s one-stop shop for craft beer and growler fills. 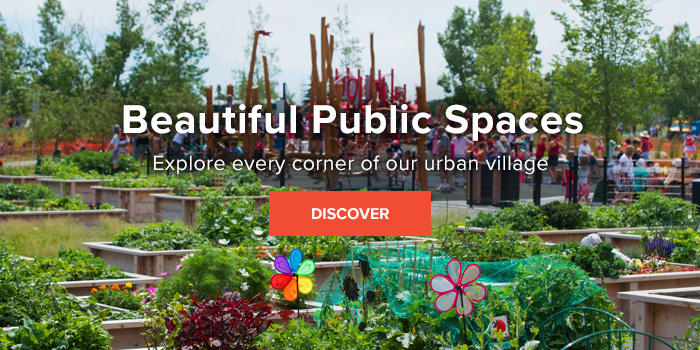 Do you dream of spending the summer outside, walking and biking through one of #YYC’s most vibrant downtown neighbourhoods – and getting paid to do it? Apply for a spot on our Event Activation and Street Team, a.k.a. EAST Crew. Visit calgarymlc.ca/careers for more info. Posting closes March 25th. We have new neighbours! @platformcalgary has moved into the historic Hillier Block, and their Junction program kicks off today. For 9 weeks, local and international first-time entrepreneurs will go through an intensive program to learn how to build successful products and companies. Welcome to East Village, #JunctionFxF participants – we can't wait to follow along with all your progress! Are we too late to jump on the #10yearchallenge bandwagon? East Village has seen just a couple of changes since 2009. Nothing major. Want to light up Reconciliation Bridge for your event?